As it has for the last 42 years, the 2018 holiday season will be celebrated with the sound of tubas at the annual Merry TubaChristmas concert. This beloved Los Angeles tradition will be held this year on Sunday, December 2, 7:00 PM, at the beautiful Hall of Liberty on the grounds of Forest Lawn Hollywood Hills, 6300 Forest Lawn Dr., Los Angeles, CA 90068. A hundred tuba and baritone/euphonium players ranging in age from 8 to 80 come from all over Southern California to play Christmas carols—and a few Hanukkah songs—to the delight of all in attendance. Guest artists will include world-renowned tubist Jim Self (the voice of the mothership in Close Encounters of the Third Kind) and the Hollywood Tuba 12, a 12-piece ensemble of top professional players. Also featured will be The Tubadours, a superb pro quartet, as well as the USC Bass Tuba Quartet. 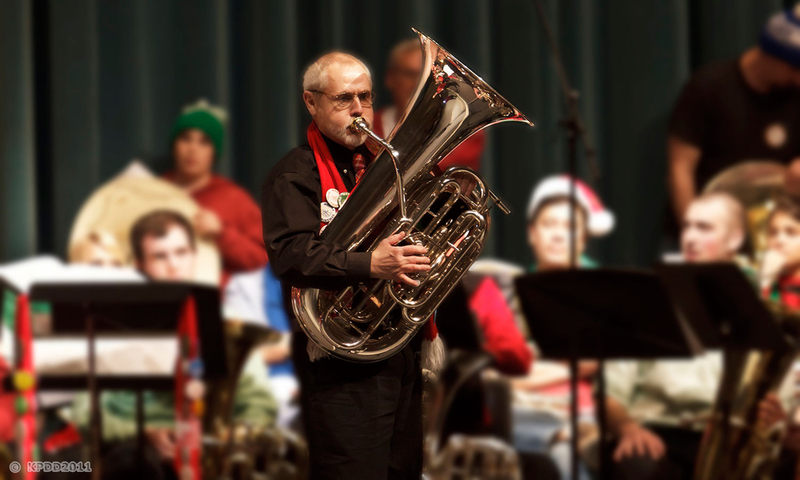 Marking his eighth year as conductor/producer, Scott Wilkinson is a professional tubist and long-time TubaChristmas participant. The concert is free to the public, and the audience is encouraged to sing along, led by Scott's wife, singer/songwriter Joanna Cazden. If we're lucky, Santa Claus himself will stop by to wish everyone a Merry TubaChristmas! You might think the sound of a hundred tubas would be raucous, but it is actually quite glorious. So glorious, in fact, that Merry TubaChristmas is performed in over 200 cities across the nation and around the world. All tuba and euphonium/baritone players are invited to play, regardless of experience and proficiency; students are especially welcome. For more information, please contact Scott Wilkinson at TubaChristmasLA@gmail.com.